PORTER-CABLE 7346SP vs 7424XP: Which is Best? Why, you might be wondering, are we looking at a sander and a polisher in the same review? They aren’t the same tool! This is a mistake anyone might make – because these two tools are identical. Porter-Cable sells the 7424XP as a polisher and it comes with a polishing pad. 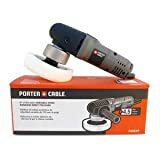 But PC also sells the same bare tool under the 7346SP designation, where it is described as a random orbital sander and is packaged with a polishing pad, a PSA pad, and a sanding disc. So, unless you’re talking about accessories or price, anything you read or hear about one of these also applies to the other (and we have an in-depth review of the PC 7424XP if you want more information that applies to both). Underneath the packaging differences, what are we looking at with these two tools? Porter-Cable 7424XP and 7346SP – So what’s different? The 7424XP is marketed as a polisher only, not a sander. The 7346SP is marketed as a sander and polisher. The 7424XP comes with just a polishing pad. The 7346SP is going to cost you about 8% more than the 7424XP. Both models are appropriate for professionals and DIYers alike and allow you to change out any number of backer heads, sandpapers, and buffing pads, in order to achieve the exact right finish for whatever you’re working on, plus each, has an easy-to-use variable speed feature that allows you to precisely control the head spin speed. People like both versions of this tool. It works well as a sander, whether users are working on wood, cars, or fiberglass boats, and it works equally well as a polisher for cars, boats and sometimes even stone and concrete. Since each gives you the ability to change out the backer heads, pads, and/or sanding discs, they both have great versatility. Each has user-friendly ergonomics, low vibration and are lightweight for the size, keeping arm fatigue to a minimum. And Porter-Cable gets moderately high marks for customer service. At the end of the day, these are the same tool dressed in different packaging. Once you own it, you get to decide what it does for you. You might actually save a few dollars by springing for the slightly more expensive 7346SP because you’ll spend more purchasing its included accessories separately. But with either tool, you’re likely to buy more backers/pads/discs anyway. Which one should you get? In the long run, the price differential will be negligible, so we suggest you go for whichever one you find on sale first.